With the caveat that “The Man Who Killed Don Quixote” might be assessed on the most loaded grading curve in contemporary cinema memory, we’ve got to say that Terry Gilliam’s long-awaited adventure tale is an awful lot of fun. Of course, the fun can be far from perfect. The film is also messy and hysterical in places, and by running an exhausting 132 minutes, it rather insistently overstays its welcome. Somehow, knowledge of the years of calamity and incident that befell this seemingly perma-doomed production can’t help but turbo-charge our reactions to it. We’re so thrilled by the film’s improbable existence that we’re willing to go wherever Gilliam wants to take us, but respond with an extra degree of disappointment whenever he stumbles along the way. Knowing full well that the myth of the film’s production is (at least at this point) inseparable from the work itself, Gilliam goes right in and addresses the matter at the start. We open with on a credit that reads “and now … after 25 years of making … and unmaking… a film by Terry Gilliam,” a move that doesn’t exactly deflate expectations but does address the elephant in the room. What’s more surprising is how many times Gilliam bring it up again. 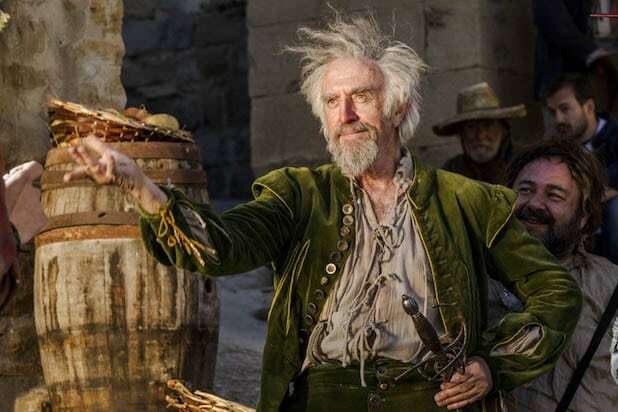 More than anything else, “The Man Who Killed Don Quixote” is fundamentally about its own creation and the obsessions that pushed the director to finally see it through. Adam Driver plays Toby, a hotshot ad director shooting a Cervantes-themed insurance commercial in La Mancha, Spain. Toby has been this way before — he actually made his name with Quixote-themed student film a decade prior — but the text has seemingly lingered in his mind. At least Toby was able to tackle other projects before inevitably circling back; his thesis film’s leading man, Javier (Jonathan Pryce), has been stuck in the role ever since. Soon enough, the two are back together, getting into hijinks at a breakneck pace and often shrill pitch. Gilliam’s madman orchestrations occasionally result in individual sequences where the action onscreen is hard enough to make sense of — let alone describe — but the broad sweep is crystal clear. What begins in the real world (or as close to the real world as Gilliam can approximate) soon gives way to fantasy. When Toby initially sets off with the ersatz Don Quixote, the film sees things as he does. By the time they end up in an opulent Moorish castle owned by venal cabal of Russian vodka moguls, we’re firmly in fantasia. But getting there is half the fun, and Gilliam plays to his considerable strengths with long sequences and short interjections that make us question what is real, what is a hallucination — and this world, what is the difference? The director hasn’t lost an inch of his Monty Python irreverence, gleefully poking holes in the narrative by breaking the fourth wall and calling attention to all the artifice. Both leads visibly have a great time onscreen, though in their frenzied glee, sometimes at the expense of the audience. It’s no surprise that Jonathan Pryce, star of Gilliam’s wonderful “Brazil,” fits easily into the director’s manic play-to-the-rafters approach, while Adam Driver proves no less adept. With last year’s “Logan Lucky” and even in part of “BlacKkKlansman,” the usually moody screen presence has displayed a lighter touch, but he’s never let loose with as much abandon as he does here. The scene where he mugs and whoops and dances a full Eddie Cantor routine in order to shock Javier out of a stupor just about sums up the project. It’s too much, it’s out of step with today and it’s oddly endearing.